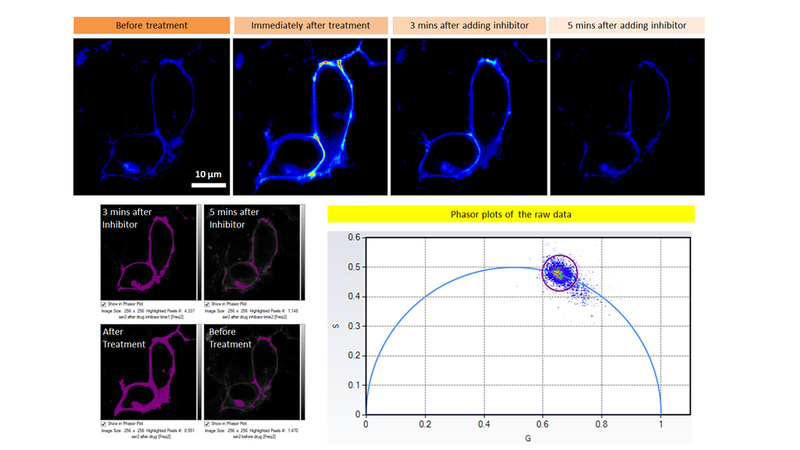 All the results are directly generated by VistaVision for FLIM-FRET analysis. 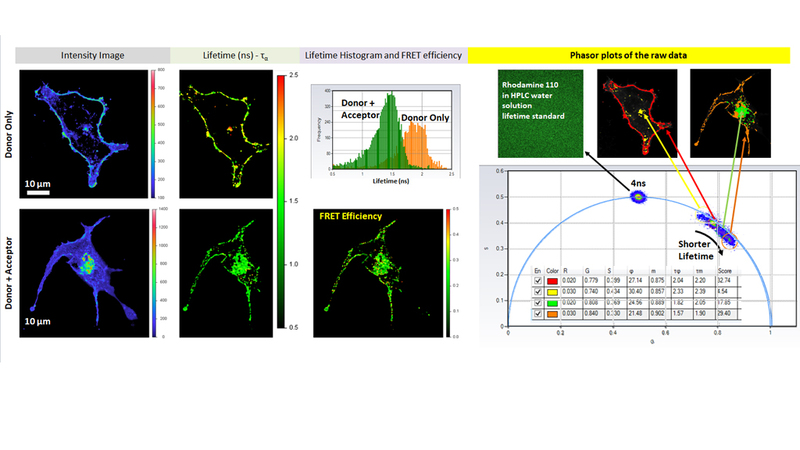 The phasor plots compares the raw data of the donor-only cell and the mNeonGreen-TM cell (in the presence of the dark quencher) .It clearly shows (1) the quenching of the donor on the mNeonGreen-TM cell membrane; (2) the lifetime of mNeonGreen-alone or mNeonGreen-TM expressed inside the cell is shorter than on the cell membrane. Acquired by ISS Alba and FastFLIM, Ex. 488, Em. 509 – 552 nm; Analyzed by ISS 64-bit VistaVision software. Sample provided by Dr.Peng Zou, at CCME, Peking University. 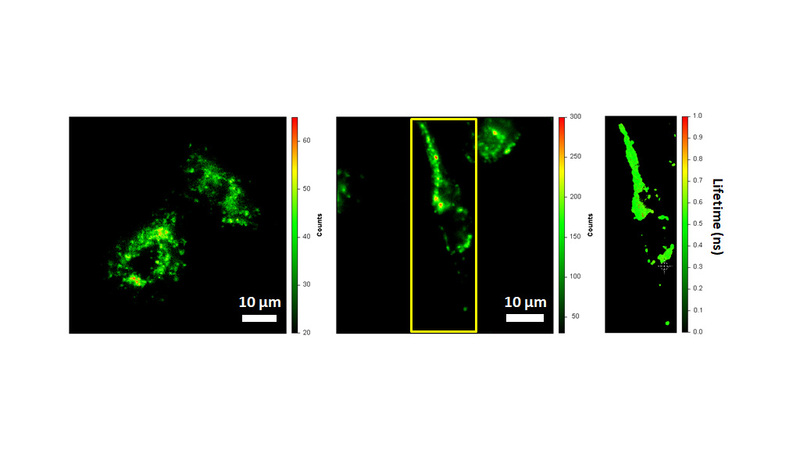 Confocal NIR lifetime imaging of HRPE-i221e. Acquired by ISS Alba, Ex. 770 nm (3.5 µW @ specimen plane), Em. 814-870 nm. Analyzed by ISS 64-bit VistaVision software. Samples provided by Dr. Yun Yan at CCME, Peking University. 4.3 FFS (FCS, PCH, FCCS，FLCS) 数据分析：软件提供超过20种拟合分析模型可用于FCS和PCH数据分析，考虑了不同的激发光点扩散模式：单光子，双光子（Gaussian—Lorentzian），2D，3D。软件提供文档输入界面便于用户自定义模型和参数。基于提供的模型，用户可测量多种荧光物理参数，包含点扩散空间参数，扩散系数、浓度、分子量，流动速率，三重太的衰减时间，等等.